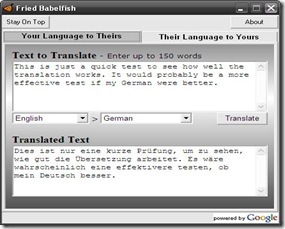 Fried Babelfish is a freeware by using which you translate the text on your machine without using browser. That means you don’t have to open a browser to translate any text. Most interesting thing is that Fried Babelfish uses Google Translator to translate the text. There are two windows in Fried Babelfish where you need to put the input text in the first window and the translated text will appear in the second window. You need an Internet connection for using this platform but don’t need to open a browser to explore the translator website. To download the free version of the Fried Babelfish, click here. Let us know your feedback about Fried Babelfish thru your comments in this section.